Governance is about how society organises itself to achieve its goals. While governments play a major role, many people and organisations outside government are also involved. NRM governance is about the mechanisms used by people and organisations to influence decisions about the sustainable use of Australia’s lands, seas and waters. The number and complexity of NRM governance mechanisms in Australia has magnified in recent years, in response to the increased use and decline in condition of our natural resources. It is unclear what impact this will have on the effectiveness of NRM governance as a whole. 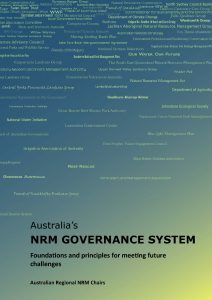 In 2010, NRM Regions Australia commissioned a discussion paper; Australia’s NRM Governance System: Foundations and principles for meeting future challenges. This paper described NRM governance as a connected system of social organisation, set within a social-ecological system. Characteristics of the Australian context that influence NRM governance design include: a variable rainfall and slow ecosystem repeat cycles; high ecosystem diversity; a range of social and political systems; local rules and customs; and a low rural population density. 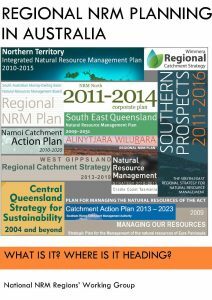 Regional NRM planning is a core responsibility of regional NRM organisations, and as an initiative that began less than fifteen years ago, its practice is still evolving. But what is NRM planning? How is it done? Why is it important? How does it relate to other land and NRM planning processes? What are its strengths and what are the challenges? And how should regional NRM planning develop over the next decade so that it can be of more value, either alone or in conjunction with other planning mechanisms. Our aim was not to suggest standardising the process of regional NRM planning or the structure of the resultant plans (which in any case are matters for state governments), but to articulate their defining characteristics and the practices that have made them work well, while still being responsive to state and regional diversity. At the 2011 National NRM Chairs’ Forum, the Chairs agreed to support the adoption of performance excellence reviews as a means of improving capability of regional NRM bodies and the NRM sector as a whole. They set a target of 85% of all regional NRM bodies undertaking the review by 2013. This target was met with the financial support of Australian Government that has encouraged and supported some 22 regional bodies to undertake performance excellence reviews during this period. 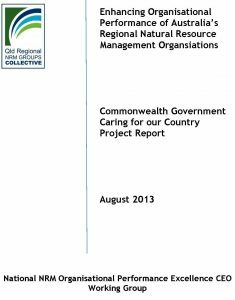 At the 2013 National NRM Chairs Forum in Mandurah WA, Chairs reinforced the importance of this project and asked the National NRM Regions’ Working Group to ensure sufficient resources for its on-going implementation.